The Falcons are heading back to Banker’s Life Fieldhouse. 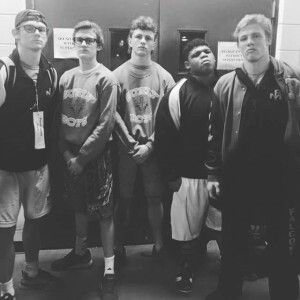 The Wrestling “Fab 5” will continue their quest of an Individual State Championship this weekend. Senior DJ Brookbank at 132 pounds, Freshman Sammy Fair at 106 pounds, Sophomore Noah Warren at 160 pounds, Senior Chris Ridle at 285 pounds, and Senior Brett Johnson at 152 pounds will wrestle on Friday night in Session I.
Noah enters the State Finals as a Sectional, Regional and Semi-State Champion. Brett earned Sectional and Regional Championships and followed it up with a Semi-State Runner-up. Sammy and DJ both advanced as Semi-State Runner-ups while Chris placed third at Semi-State to advance. Session I begins Friday at 6:00 pm. With a victory the wrestlers would advance to Session II which begins Saturday at 9:30 am. ​​The consolations (Session III) begin at 4:45 pm with the Finals to follow on Saturday.